The best blender you can buy is the one that fully supports you in having permanent fat loss. With this tool you can move beyond imagining your ideal weight and excellent health to actually having both! That's because you are able to consume the quantity of nutrient dense foods that you need and make healthy dinners fast and conveniently. I love my new Vitamix blender! * It not only blends, it juices, it chops, it makes soup, heck it even makes sorbet! There is no juicer on the market that can do what the Vitamix blender does. I've known about Vitamix for a long time but I struggled along with my juicers in spite of the fact that they were a pain to clean. So many of the nutrients went into the compost because the fiber, the most nutritious part of the plant, was separated out. 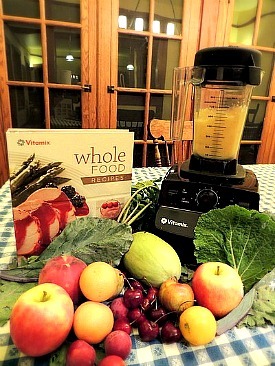 With the Vitamix you get the juice and the fiber with all it's health benefits. The best blender has the motor power, torque, speed, container and blade design to make any food you put into it into a smooth liquid. You cannot harm the blade because it is indestructible and has overload protection. It has a 2 HP motor that spins 240 miles an hour; it's an 11.5 amp 1380 watt motor with all the torque, speed and blade design to make even nuts into nut butter. The container is BPA free hard plastic that's as hard as glass and you clean the entire unit by putting a drop of soap in it and spinning it on the base. Rinse and you're done. The Vitamix practically cleans itself and does a jig afterward. Why do you need one with this much power? In order to restore the metabolic capacity of your cells you need a complete overhaul of your body and a machine that will do the job of delivering a quantity of nutrients efficiently. This machine is so well engineered and designed that it has a 7 year warranty but I've read that some people keep them so long they pass them down to the next generation. The best blender I've found on the market, the Vitamix, is made by an American manufacturing company based in Cleveland, Ohio. It's been around for over 40 years and has an excellent reputation and an excellent customer service department. To increase your insulin sensitivity and restore your cells to health, believe me you need lots of greens every day! There is no better way to get rid of fat super efficiently than consuming so many nutrient dense foods that you lose your cravings for high glycemic foods and regain your cellular health. You can not only make all the diet smoothies you love much more efficiently but you can also chop cabbage for coleslaw, chop ingredients for salsa, crushed ice for drinks and even make your own spaghetti sauce using whole tomatoes ! The best blender helps you to eat whole foods much more efficiently. You will be able to make your dinner in a smoothie 2 or 3 times a week to really accelerate your lifetime fat loss, low glycemic plan. There is no food you could put in a smoothie that would overtax the Vitamix blender. This versatile machine even makes amazing desserts that are easy to make without sugar because you can make fresh fruit sorbets! You won't miss ice cream when you can throw together a fresh strawberry yogurt freeze or a peach soy sherbet. How about orange sorbet made with fresh oranges? I love making our entire dinner in a blender that can be washed by rinsing it out, filling it halfway with water, squirting in a drop or 2 of soap and running the blender for 2 minutes, rinse and that's it! The Vitamix comes with two recipe books have great ideas for your low glycemic eating plan. This is a serious blender...the best blender you can buy. This is the reason I recommend it and own it because it's the most important tool for me and you, my readers to own. If you buy one here on my website you will get FREE shipping saving yourself $25 and you will be supporting Lifetime Fat Loss. ***Just click here to purchase the one in the image above, the one I own, the 5200. Juicing every day will put your Lifetime Fat Loss Low Glycemic Plan on steroids. There is a reason for this...you are deficient in vital nutrients your body needs to release fat. People who are overweight are very acidic and need to eat far more alkaline producing foods! You have to change your body's biochemistry and here's how to do it. Fat people have serious hormonal imbalances that need to be corrected. You will not have to worry about ending up with cancer (or being fat) if you eat these powerful super foods. Do you want to make sure that you lose weight and are healthy forever? Develop the juicing habit. Each of these is a powerhouse of nutrition and will help you be skinny for life. The truth is this is the only way to get enough alkaline foods. Return from The Best Blender You Can Buy to Food Nutrition Facts. Return from The Best Blender You Can Buy to Lifetime Fat Loss home page.